Hudson Lindenberger is an award-winning writer and editor based in Boulder, Colorado. He believes that life is full of interesting stories, and his goal is to tell as many of them as possible. As a full-time freelance writer, he is always searching out and following interesting paths while maintaining a smile on his face. 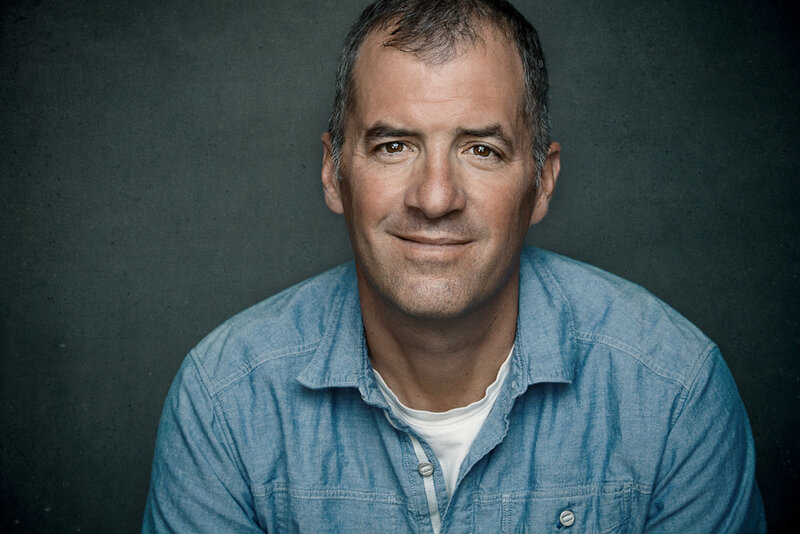 Hudson is the father of two adult daughters, an active outdoorsman, and an avid traveller. You can learn more by visiting http://hudsonlindenberger.com. “You bought an electric bike?” My buddy cried out incredulously. “What’s next? You going to start wearing a beret and smoking cigarettes?” He sat back snickering over his beer looking dubiously at me. I can’t say that I blamed his attitude, just a little while ago I was him, I was the guy mocking people on electric assist bikes. When I moved to Colorado two decades ago, I was like most new residents, the chance to get outside and into adventures was intoxicating. I first moved to Nederland—that funky, flaky town perched above Boulder. During my three years there, my closet swelled with day packs and hiking shoes as I explored the Front Range. Upon moving into Arvada, I found myself going on bigger trips. The tops of high peaks called, and overnight trips beckoned. Very quickly, I had a full array of camping gear. Like most Coloradans, my gear addiction had started. My move into Boulder a decade ago really allowed me to dive deep into the outdoors. I started climbing, skiing, and trail running whenever possible, but my true passion became cycling. I became a spandex wearer and started to shave my legs. My garage became cluttered with bikes of all sizes for my family. There were cruiser bikes, mountain bikes, cyclocross bikes, and road bikes. Whenever possible, my wife and I would jump on our road bikes and roam the hillsides and flats surrounding my town. I had become an avid cyclist, and I loved it. The effort of climbing hills and blasting down their backsides was wonderful. I could easily spend a few hours out with friends working up a sweat and having fun. But when I saw people zipping by on electric bikes, I would turn my nose up at them. “Fake riders, cheaters, earn your miles,” were just a few of the phrases that came out of my mouth. When the chance for my wife and I to relocate to France popped up three years ago, we decided to go for it. It had been a dream of ours to live abroad, and we figured Lyon, France sounded like a great spot to try it. Pretty soon we boarded a plane with two large bags each, two road bikes in travelling cases, a dog, and a cat. There was no way we were going to the land of Le Tour without bringing our bikes. Within days of our arriving, we were out exploring our new home on our road bikes. Living in the hilltop village of St Cyr au Mont D’Or just outside of Lyon proper, we had plenty of places to explore. The French cyclists embraced the crazy Americans and the drivers were courteous—not like here in the States. While we got used to the more relaxed lifestyle in France, we also started to notice that there were a lot of electric bikes around. The mailmen rode them to deliver the mail, old ladies rode them into town, commuters used them to get into and out of the city, and large groups of older men ripped through the trails on them. Gradually, my attitude started to soften. My interest was piqued. When we took a trip to Copenhagen in the summer, my wife and I decided to rent ones while we were there. They actually have an electric bike share program throughout the city. It only took one day of exploring the city for me to be hooked, it was a blast. I remember thinking what was my problem with electric bikes? All around me I saw people commuting throughout the busy metropolis on bikes of all shapes and sizes, both electric and not. Instead of streets packed bumper to bumper with stinky smelly cars, there were bikes zipping up bike lanes, down alleyways, and on streets. When we left to head back home, I decided that I wanted to get an electric bike when we got back to Boulder. Sure, I had a good cruiser bike waiting here, but truth be told, I rarely rode it. In the summer it made me a sweaty mess, and in the winter I did not want to deal with the hassle of it. Instead, I did most of my commuting in town in my car. I had good intentions of riding it more, but just could not find the motivation to do it. … Instead, I was another car clogging up the streets of Boulder. As most residents of our state know a lot of people are moving here. In fact, only four states have had a higher percentage of growth since 2010. There are currently 5.7 million people living inside our borders with roughly another 75,000 arriving each year. It is phenomenal growth and one that is taxing our infrastructure. Roads are getting more crowded and are falling apart quicker. I used to be able to drive across Boulder at rush hour in 10-15 minutes when I moved here, now I am lucky to make it in 30 minutes. More cars lead to higher pollution levels, angrier people, and more accidents. Regardless of what our elected officials do, the reality is the system is slowly getting swamped. But imagine if we could get more people riding bikes. Instead of adding to the congestion of heading to work, the gym, or grocery in their car, they hop on their bike. The latest statistics show that biking is growing. Last year, 47.5 million Americans said they rode a bike at least once a month, that is 12.4% of our population. Of those riders, almost 25% of them are adults between the ages of 30-49. One way to encourage more people to bike is to improve the infrastructure and incentivize people to ride more. Electric bikes are perfectly poised to draw more people out of their cars and onto a bike. Look at China for example. In 2000, there were 300,000 electric bikes sold, by 2016 that number was up to 33 million a year. Across Asia, electric bike sales are soaring, and they are starting to quickly infiltrate Western Europe, the number two market for them. In America, they are just starting to appear in cities and towns, especially areas with high densities of young working adults looking for a way to break free of their cars. 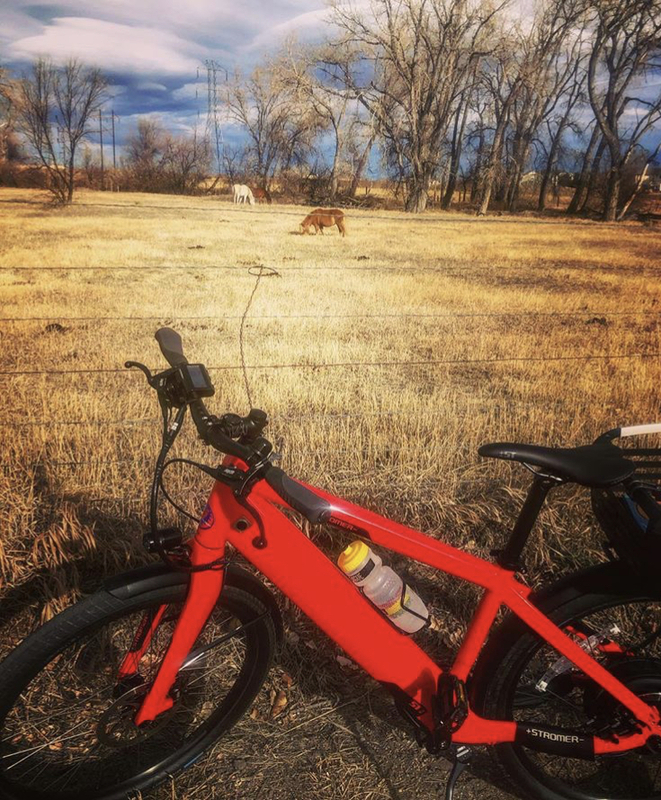 Within days of buying my electric bike, I quickly changed my habits. I started jumping on it for any errands in town. Meeting people for a cup of coffee was a breeze and shopping for groceries became simple once I added on pannier bags. Best of all, whenever I arrived anywhere, I was not a sweaty mess that had to sit down and cool off before meeting anyone. My wife (she bought one too) would go out to dinner on them. If I wanted to have one more glass of wine, I might have it since I was not crawling behind the wheel of a car. When winter arrived, I would just toss on my windproof jacket and gloves and head out, provided the roads were clear of snow. I actually found myself monitoring the weather forecast to know if I could leave the car parked. My weight dropped, I felt great, and best of all, I could zip to anywhere in town often faster than I ever would have in a car. After six months, my bike’s odometer showed that I had logged almost 500 miles and close to 36 hours of ride time. That’s all entirely inside the city, time I would have been in my car. Plus, I still get out on my road and mountain bikes when the weather cooperates. So, it’s safe to say that my attitude about electric bikes has changed. I have become an advocate of them. They could be one of the solutions to the problems that our state, country, and planet are dealing with. Transportation overcrowding and the subsequent issues that that causes. Electric bikes won’t solve everything, but they could help. 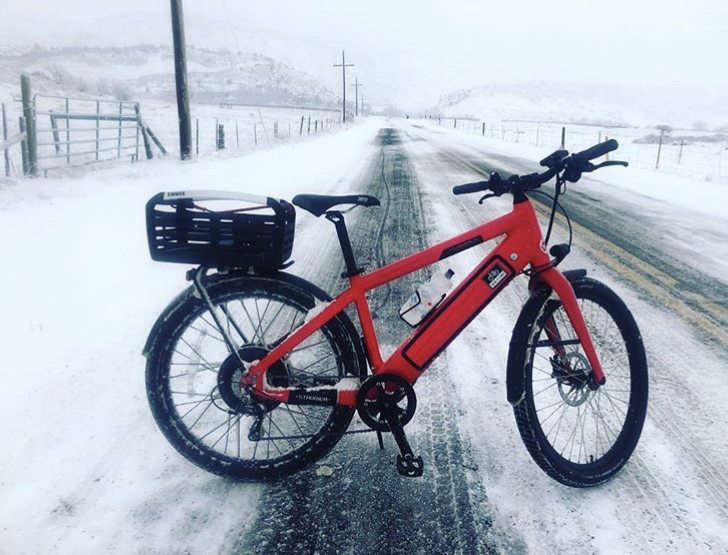 Last December I too joined the #ebike revolution and invested in a Stromer from my local bike shop (C3 Bike Shop in Golden). I LOVE riding this bike -I can run legitimate errands averaging over 15mph and not be exhausted or fatigued for my cycling training/intervals. I can ride in nice dress clothes and not break a sweat, arriving at my destination “put-together” instead of a hot sweaty mess. 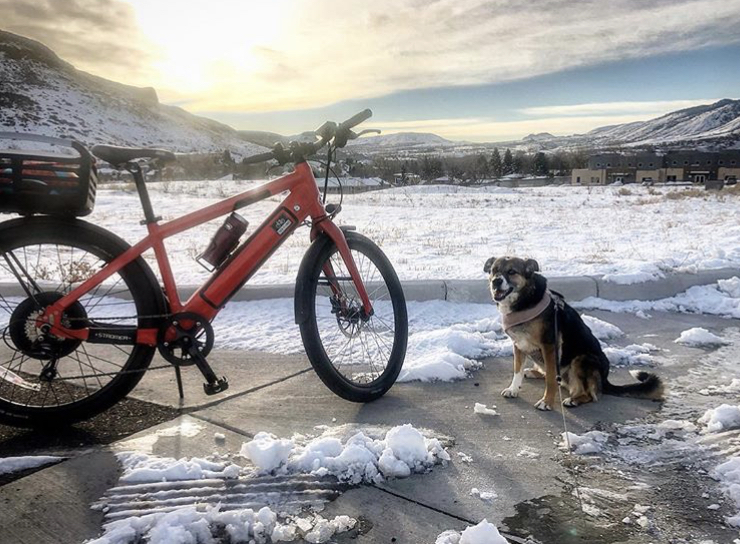 In addition the extra “oomph” will make it possible for me to hook up my doggie-specific Burley (once the snow melts) and tow my 55# dog, Phoenix, in the back, while my other dog Ramsey runs alongside (or rides with her sister). This combined weight would not be feasible for me on a regular bike, but with an E-bike, #allthingsarepossible. Comment below if you’ve got an ebike, tell us which one you got, and what you love about it!